This book explores the importance of ritual and ritual theory to discourses of authenticity and originality, thereby deepening our insight into concepts of cultural heritage, identity and nation in a globalised world. The volume is the first interdisciplinary attempt to understand the significance of rituals and related performative traditions in the creation of grounded cultural identities, `home' and heritage as geographically experienceable locations. It assembles perspectives from social and cultural anthropology, performance studies, education and arts that can deal with the politics of revitalisation and preservation of ritualised traditions. 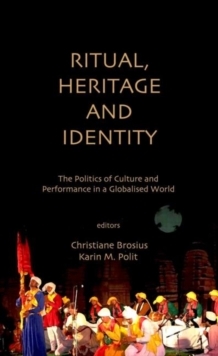 While some chapters in this book emphasise on the ritualisation of cultural heritage by concentrating on power relations and politics, as well as actual processes of identification, especially for marginalised ethnic groups or migrant communities, others explore how rituals as intangible heritage are strategically employed by different groups all over the world to make their claims public and to improve and negotiate their position on a local, national or global platform. This book recognises ritualised performances as transnational and cross-cultural phenomena, which are not only tied to and defined via national territories and identities but which also demand new theoretical and methodological approaches towards the discussion of rituals and heritage.